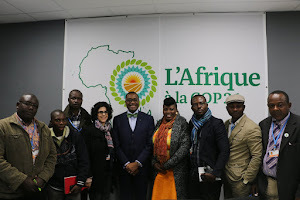 PARIS France, (PAMACC News) – As Africa prepare to embark on the path towards green development, technocrats on the ninth day of climate change negotiations in Paris have observed that there will be need to invest much more in training particularly the youth, who are drivers of the future economy. In an event hosted by the Africa Development Bank (AfDB) to discuss skills and human capital development for green growth and climate adaptation in Africa, Guy Ryder, the Director General for the International Labour Organisation (ILO) said that solving the climate crisis and solving the global unemployment crisis are two interrelated challenges that must be integrated. “In the next 20 years, effective action on climate change has a potential to generate 60 million new jobs, which is fantastic, but not automatic,” he said. “We can’t just sit and wait it to happen. We have to make it happen by addressing skills and training deficits,” he added. He pointed out that there are some occupations that will continue, and therefore the demand will either go high or low, while other occupations will need to be upgraded. At the same time, there will be new occupations in the labour market, while other occupations will disappear. Speaking at the event, Goodness Morategi, a social science student from South Africa said that there was need for African countries to include climate change in learning curriculum in schools right from the primary level. “In order to attract the attention of the youth to this fairly complicated subject, we need to change the discourse and make it youth friendly, and not too scientific as it is,” she said. However, the Chairperson of The National Gender and Equality Commission (NGEC) in Kenya Winfred Lichuma said that the discourse must involve the entire human race. “We have to go beyond the [formal] education system, and capture the entire community,” she said. “Some skills can be learnt just by seeing and not necessarily through learning institutions,” she said. The discussants observed that there has been a missing link between climate change experts, women, young people, disabled people, indigenous communities. “we need to empower everybody because all these people have something we can learn from,” said Lichuma. The main aim of the event was to generate key policy messages that will inform the design and implementation of future programmes and projects and policy advice on skills and human capital development for green growth and green jobs in Africa. In addition, African countries will be able to share their experiences, learn from one another and benefit from experiences of projects implemented in other world regions.